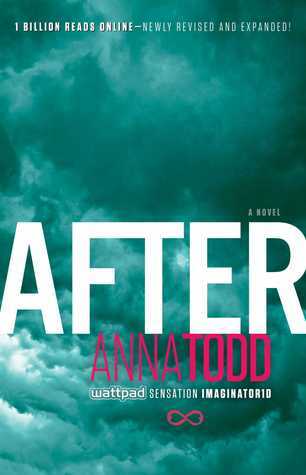 Anna Todd’s After is a classic “good girl meets bad boy” love story that began as a fan fiction romance about teen heartthrob Harry Styles (of British boy band One Direction). It became such an online phenomenon that the story has since published by traditional book publisher Simon and Schuster and movie rights have been optioned. After is a fun, entertaining read, and I zipped through the book in a weekend. Hardin (the Harry Styles character, renamed for publication) is definitely not my choice in boyfriend, whether literary or real life, but I think that’s just me being old. I can imagine teenage me going gooey at his broody grouchiness. As Anna Todd said when I met her at Indigo, there’s something undeniably attractive about being the one woman special enough to make the bad boy want to change. And indeed, as with Twilight, Fifty Shades of Grey, Wuthering Heights , Pride and Prejudice and other such influences for this book, in After, bad boy Hardin falls for good girl Tessa and finds the impetus to change his ways. As a hero, Hardin insults Tessa, smirks a lot (though nowhere near as much as Edward Cullen) and acts like he’s too cool for practically everything. I had been dreading a controlling, abusive bad boy type, but he struck me more as bratty than abusive. The romance and their arguments felt immature, more Sweet Valley High than Fifty Shades of Grey, and it was more amusing than anything. To Anna Todd’s credit, Tessa isn’t the precious snowflake that Bella Swan and Ana Steele are. She’s a young, innocent girl who is so prim and proper at the beginning that even I wanted to tell her to loosen up. She’s a realistic character, even with her odd quirk of setting alarms for every single bit of her day, but her personality shift happened much too quickly. The odd quirk of setting multiple alarms was abandoned fairly early on, and while she never turned into a Jessica Wakefield, she still felt like a completely different person a few chapters into the story. To be honest, the turbulence of their relationship didn’t bother me as much as the fairy tale nature of Tessa’s internship. Minor spoiler alert for the rest of this paragraph: she lands a dream internship at a publishing company thanks to Hardin’s family connections (shades of Fifty Shades here). Thing is, the internship is so good that it stretches credulity past the breaking point — it’s paid, for one, and despite the job being just a part-time internship, the pay is enough for rent. Also, Tessa gets her own computer, her own phone line and her own office. Then, during her first day, the head of the company gives her a stack of manuscript submissions and tells her to send on to him any manuscripts she thinks worth publishing, and to throw away any that she doesn’t like. Seriously? I’ve never worked in publishing, so there may be some truth to this, for all I know. But I doubt it. Now, granted, a lot of my response is sour grapes at not having my own office, but well, even a wish fulfillment fantasy should have some credence of believability, no? That being said, the romance was entertaining to read. There were some troubling aspects, but again, I think Hardin’s brand of bad boy was just too immature for me to really get into. Tessa’s jealousy over Hardin’s past relationships leads to some pretty stupid decisions, but again, it all feels very high schoolish. I generally like YA, and I know there are adult fans of this story. I’m just not one of them — I think I’m just too curmudgeonly and at multiple times wanted to tell the characters to grow up. But I did enjoy reading the book, and I even might pick up the next book in the series for a snowy weekend. Thank you to Simon and Schuster Canada for a copy of this book in exchange for an honest review. This entry was posted in Book Reviews and tagged 50BookPledge2014, Fiction, Romance, Simon and Schuster, YA by Jaclyn. Bookmark the permalink.